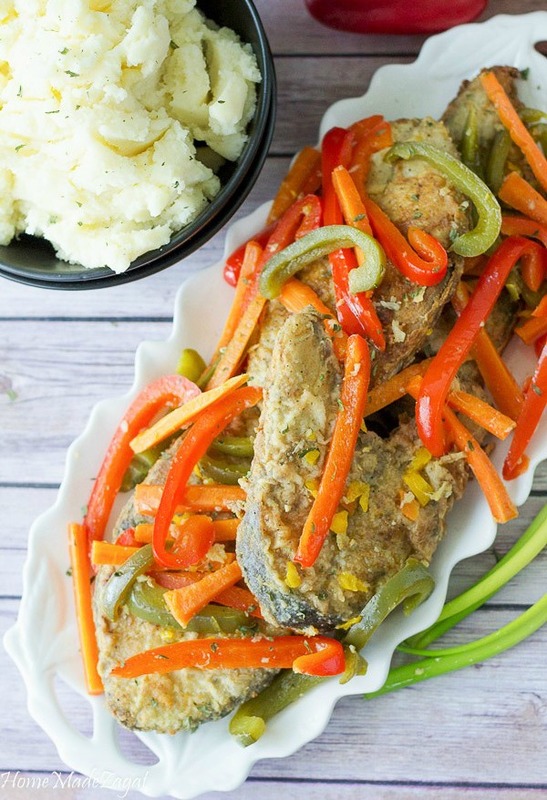 A fried fish dish doused with a pickled sauce with vegetables. I don't eat fish often enough, but when I do I dive into some escovitch fish. 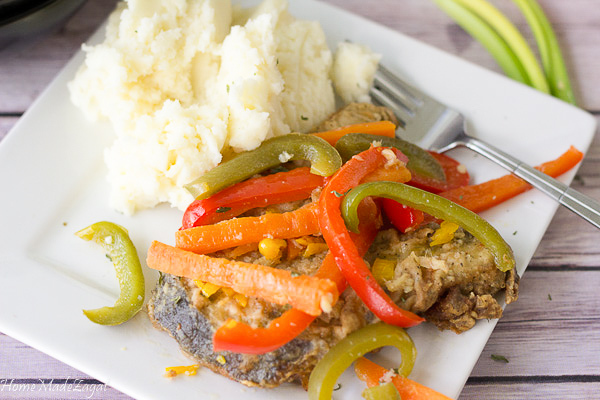 This Jamaican fish dish is extremely popular and everyone has their unique twist to it. 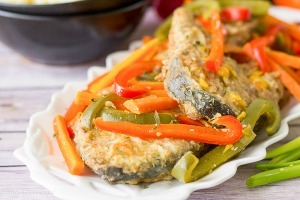 The fish is fried and then covered in a sea of vegetables that have been simmered in a spicy vinegar mix. Did I mention that it's spicy? The added pepper gives the fish a great flavor and leaves you with a runny nose as you eat but not wanting to stop. Now normally when I get this from the restaurants, they give you a whole fish fried. But I opted to use slices of fish here. Tilapia or kingfish are great options. The process really doesn't change for whatever type of fish you are using. The most important thing for me with fish is to make sure it's clean and not smelling "fresh". So you will need to get a lot of limes and soak the fish in it. Once your fish has been soaked out, you're ready to season up. I live by my green seasoning. It's always on hand. I think all Caribbean households have green seasoning by the bottle load in their fridge. It's so easy to just grab and pour into whatever meat or sauce you're making. A golden brown fried fish is what we want our fish to look like. When I am ready to flour the fish I try to take off any excess liquid (seasoning or water that may have sprung from the fish sitting). 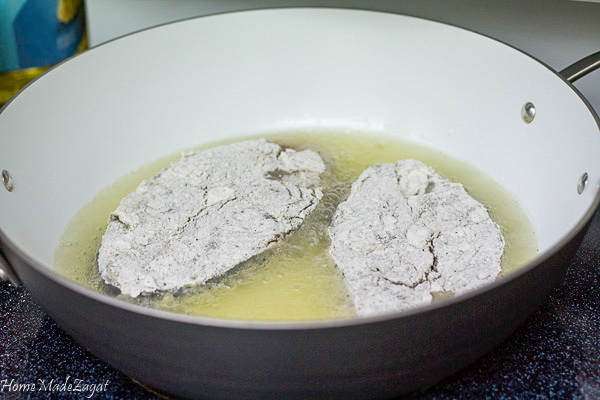 This makes sure there are no clumps of flour on the fish and when it is put into the hot oil that it fries evenly. The fish being fried to perfection is important. The fish being under cooked or overcooked and burnt can ruin the meal easily. Once golden brown, turn and fry on the other side. I like to put the fish in the oven till all is fried up and also while I prepare the veggies. I have my oven on a low temp (say 250) and pop the fish in there to do the other stuff. Now this is where the recipe can be adjusted to your liking. What veggies are your favorite? You are free to use them here. Just make sure they can stand up to a little cooking. We are not trying to get a vegetable that wilts quickly. I love to have some crunchy veggies. I opted for bell peppers and carrots. I love carrots in this dish. Onions, chayote (also called christophene or cho cho) are also great additions. 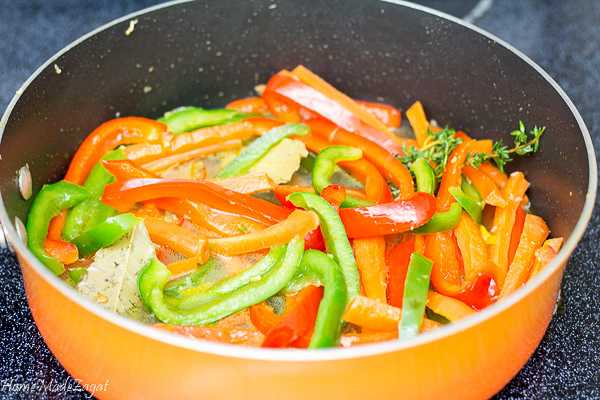 These vegetables are sauteed and simmered in a sauce of water and vinegar and some salt. Oh, don't forget the bay leaf and thyme. Now it's time to merge the two components together. Layer the veggies on top of the fish and pour the sauce all over. It's not to be dish with a lot of sauce (gravy) say like the brown stew fish. The sauce should be enough to be soaked up into the fish so that it's moist but not drowning in liquid. In fact, I usually do not have any type of gravy in the dish with the fish at the end. Some people like to leave the fish to cool to room temperature. This gives the fish some more time to soak in the vinegar sauce. It tastes good at room temperature but I personally like to eat it warm. Warm fried fish with these spicy and crunchy veggies, especially the carrots. Crunchy carrots with slight pepper. Did I mention I loooove the carrots? 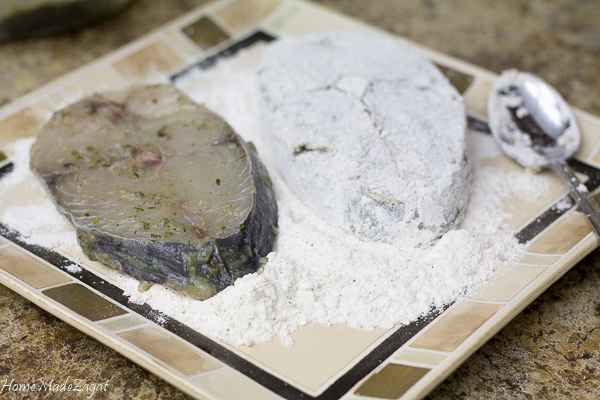 Traditionally escovitch fish is eaten with bammy or fried dumplings, but there are no rules for food. It can be easily paired with any side: mashed potatoes, rice and peas, fried plantains or even hard dough bread. You are free to choose whatever side you like. So excuse me while I sniffle through eating up this leftover fish! 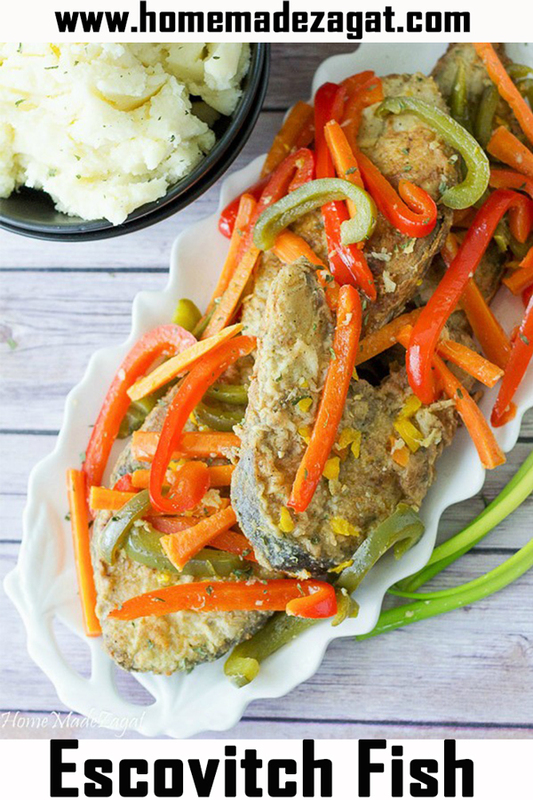 An easy recipe to make Jamaican Escovitch fish where the fish is fried and then sauced with vegetables cooked in a spicy vinegar marinade.